Transistor Degradation - mb-techs Webseite! The temperature controlled testsystem HC20 has been designed for investigate the degradation mechanisms of CMOS- and bipolar-transistors and other semiconductor devices. The measurement consists of a series of stress and measurement cycles. The DUTs (device under test) are stressed simultaneously and individually measured. The system consists of up to six independent units. 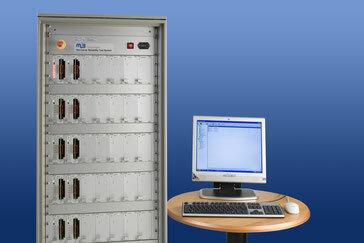 Each unit consists of four SMUs (Source Measure Units), two Multiplexer and two customer specific DUT-Boards. Caused to the compact design, there is no additional wiring necessary. Per unit can be performed either two independent experiments with two SMUs each or one experiment with four SMUs. All functions of the system will be controlled by the interactive software mb-Tester. Besides the basefunctions for creating setups and execute experiments the software has additional features such as: analysis of the measurement data, customized export data interface, a built-in scripting language for creating measure functions and adjustment of experiment flow, an enclosed library with measure functions, monitoring and status functions. As degradation parameters any number of individual values or curves can be defined. A voltage or current stress ramp of up to 100 single stress-time-values allows an universal adaption of the stress dynamic to the customer needs. Since the measurement in the testsystem will be executed locally, also in larger systems a high speed can be reached. During the stress phase voltage or current can be measured and early fails can be detected. Defective DUTs or those in which the predefined degradation limits are exceeded will be automatically turned off if desired.